When I said I wanted to try gold mining 1850s-style, friend Derek Polderman built a gold cradle based on an original in the Eldorado Museum. Last Tuesday, we took it ‘down the Woolshed’ to try our luck. All methods of separating alluvial gold from wash dirt used on the Spring Creek diggings in 1852 — the pan, the cradle (aka. rocker) and the long tom (aka. Californian sluice) — relied on the fact that gold is heavier than anything else it is mixed with in the ‘wash dirt’ (also referred to as ‘washing stuff’ or sometimes just ‘stuff’). On the Ovens diggings, the washing stuff generally comprised (and still does) some regular sand and pebbles ideally containing as higher proportion as can be got of fine whitish-grey or dark grey ‘pipeclay’ containing the tell-tale ‘black sand’ (tin dioxide). Sometimes the clay needed to be worked in a ‘puddling tub’ (usually, a half hog’s head barrel, with an agitator) to loosen it before it could be cradled. With a design imported from the Californian gold fields, the cradle was a simple but effective hand-operated device used by diggers to separate gold from washdirt by means of a rocking motion. At the very top of the cradle is a classifier sieve (usually with half-inch or quarter-inch openings) which screens-out larger pieces of rock and other material, allowing only finer sand and gravel through. 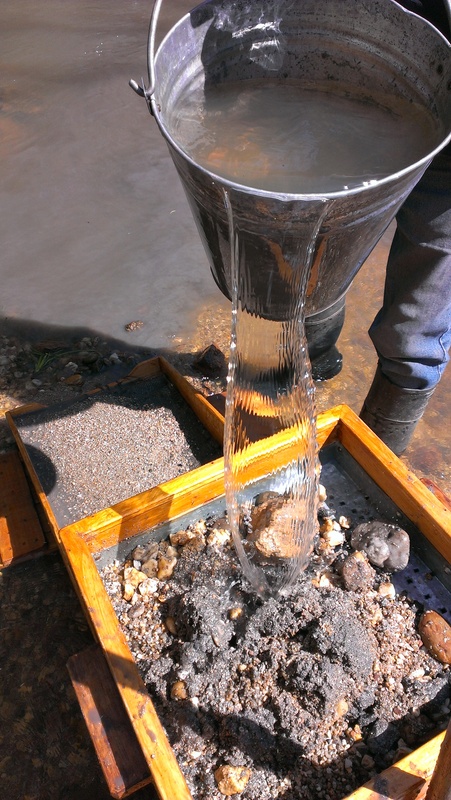 Between the sieve and the lower section is a baffle with riffles, which acts as a trap for fine gold and also ensures that the aggregate material being processed is evenly distributed before it enters the bottom sluice section. The baffle sits at an angle, pointing down towards the closed back of the box. The inside bottom of the box is lined with a carpet (ours has hessian), which also has riffles. The entire device sits on rockers at a slight gradient, which allows it to be rocked from side to side by its handle. 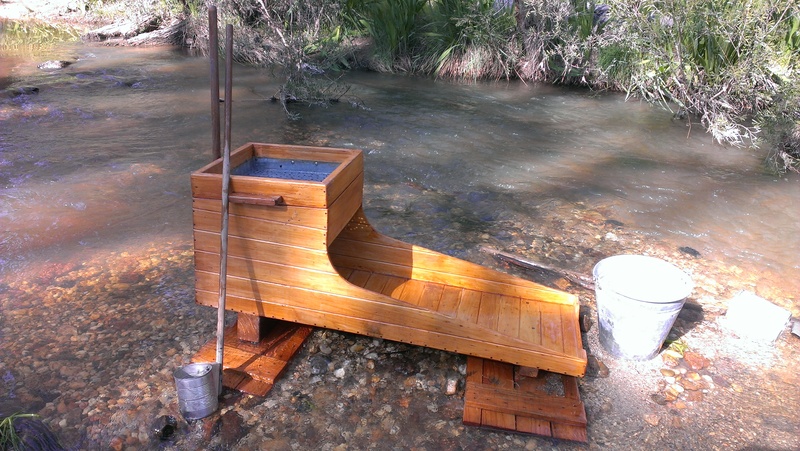 The rocking motion, along with a stream of poured water, washes the earthy matter and the gravel through the sieve, down the baffle and out the end of the cradle. This leaves the gold, mixed with heavy, fine black sand, concentrated either above the first riffle at the bottom of the box, or as we were to find, also caught in the hessian fabric, or washed to the bottom plate of the box itself. 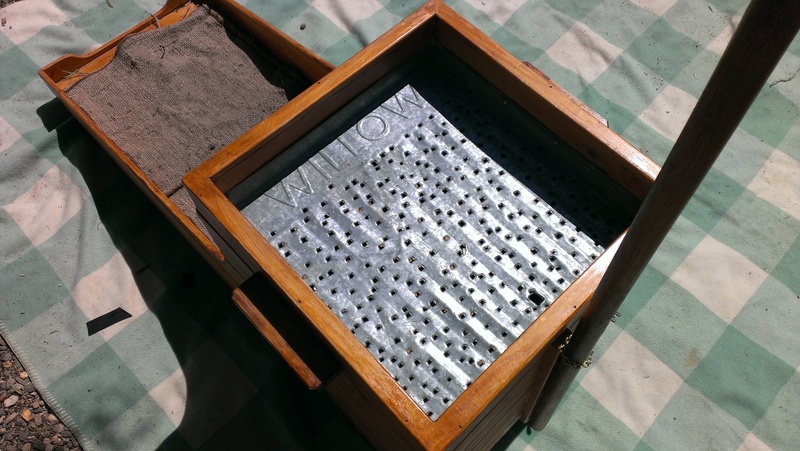 The classifier sieve is made from an old rubbish bin, but traditionally the sieves had evenly-arranged round holes. The first baffle with wooden riffles. The second riffle of the lower sluice section (sewn into the hessian) can be seen below. For maximum efficiency, at least four men were required to work this system: One dug the stuff from the ground, another carried it to the cradle and emptied it on the sieve; the third gave a rocking motion; while the fourth dashed on water from the stream itself, using a ‘dipper’ (a large can on the end of a rod). This team could be expanded to include someone to ‘puddle’ the stuff before placing it on the sieve. Pouring water into the cradle. The grey clay being washed through the cradle can be seen exiting the cradle’s end and flowing into the creek. Derek and I put ten shovels through the cradle, cleaned the cradle and repeated the same, with minimal effort. We didn’t have anything to ‘puddle’ the stuff in before cradling it, and as it turned out, this would have been preferable as some of the clay was extremely sticky and stiff, and had to be loosened by hand. 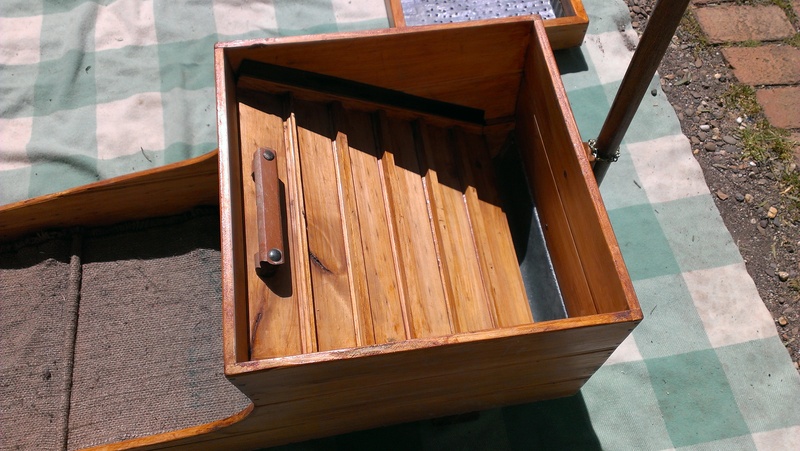 To clean out the cradle, first the sieve was removed, and the baffle was pulled out and held over a large plastic tub on its side (riffles facing down), where we washed any trapped sand/gold into the tub with splashes of water. (We also found that it paid to be careful when pulling out and replacing the baffle, as this can become jammed-in by sand.) In the very bottom of the cradle, a lot of washdirt could be scooped out by hand. This was panned-off, and there it was: gold. Then we were left with the remainder — stuff caught in or beneath the hessian fabric. Historically the fabric was nailed to the bottom of the box, but Derek had made the hessian in this cradle detachable (it is held in place by a metal clamp which is secured/loosened by wing-nuts), so we removed the hessian and washed it in the large plastic tub. Finally we washed the dirt from the very bottom of the cradle into the same tub. 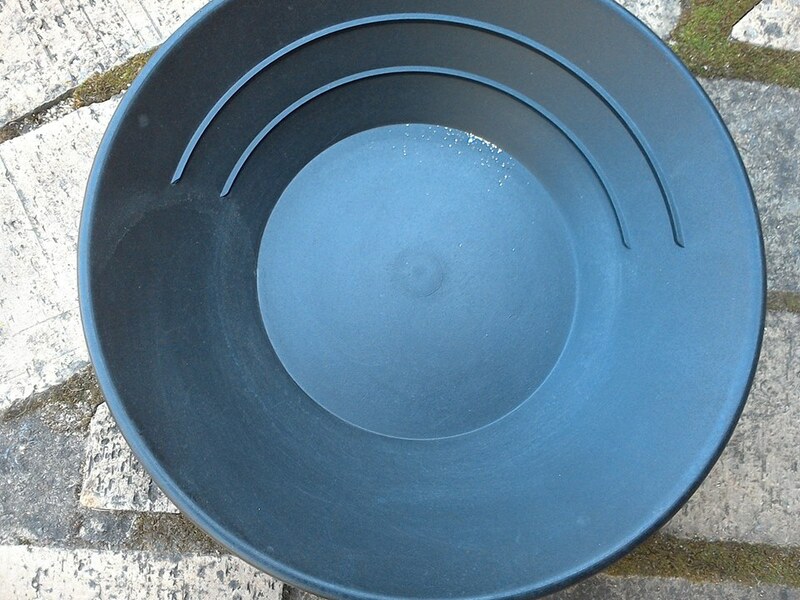 The contents of the tub were panned-off and found to be far richer than the other panned material (panning for gold is another story [and another blog topic] altogether). The system was fiddly, but remarkably effective. We had recovered as much as 100 specks of fine gold — and this from a creek that already has been mined and dredged for 163 years. The result. We won’t be rich anytime soon, but there’s gold. Derek built the cradle with a little help from Howard Phillips at the Eldorado Pottery. While it is based on the cradle in the Eldorado Museum, he gave it a few modern modifications. The cradle will be donated to the museum for educational purposes. Edward Ridpath, Journal, MS 8759, Box 1012/4, State Library of Victoria manuscripts collection, pp.21-22.